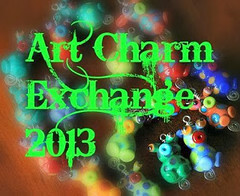 Autochthonous Evolved - Jewelry and Lampwork Beads: Bead Soup Blog Party 7 REVEAL! I know you want to see pictures. They're here. But they wouldn't be here if it weren't for, first, the indomitable Lori Anderson who planned the Bead Soup Blog Party and assigned us all partners, and second, my amazing and awesome partner, Kristin Oppold, of Yay! Jewelry. Thank you ladies so very much. No less significantly, however, is you - you're here sharing our experience and your time to see what we've made. Thank you so much for stopping by! We've all had challenges in creating our designs for this Blog Party. I've been following along with Kristin's admirable struggle to find a way to use the focal bead I sent to her and still be true to her style. My struggle has been one of health over the last three weeks - trying to fight off acute bronchitis - along with my usual task of keeping my preschooler, Sawyer, from creating too much chaos. It's been frustrating because I sketched out designs for everything Kristin sent six weeks ago. It's just been a matter of finding the time and energy to get it all done. The most important piece - the one using Kristin's focal and clasp - is done. The piece using the silk and pearls she sent - the piece that was a true divergence for me - is also done. I also finished matching earrings for the bracelet, and another pair using some of the lovely faux beach glass she sent. Five designs I planned for the other wonderful things she sent are, frustratingly, still on my work table. They will, however, be done soon. Everything she sent, even the things that made me scratch my head a little, were too great not to use. Let's take a look! What I did with them was this. Inspired in no small part from one of my most favoritest jewelers ever, Michael Boyd, I did a lot of metalwork on this. All of the metal in this piece except the small chain started as sheet silver and fine silver wire in my studio. I made the lampwork beads myself after sketching out the necklace design. No glue whatsoever on this piece. Just the miracle of Material Science and elbow grease - about 15 hours worth - in action. The cabochons and metal accents you see on the stones are all riveted into inverted conical holes I drilled in the stones; nothing comes through the back. 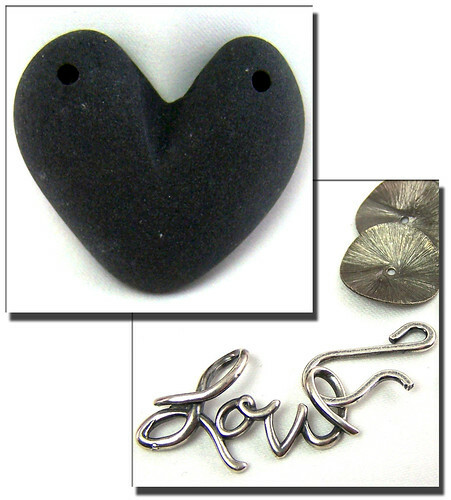 When I sketched out this necklace I was looking for a way to use the stone focal heart that Kristin sent. I had, of course, been compelled to look at all of Kristin's work and saw that she had created a necklace using a pendant similar to the one she sent to me. So, of course, having that in my head, I felt a fierce compulsion to try and ignore that vision in my head. Consequently, I felt like where she had fostered natural warmth in her design, I needed to go with mechanical and cold. In order to accomplish this in a way I felt did justice to the focal, I dug deep and pushed my skill set to its limits. That's when I decided to implement some of the stone stacking techniques I've loved in Michael Boyd's work for so long. I didn't intentionally set out to create something that could be called "Steampunk," but I think that in the end that's where the design went. I can't deny that I am outrageously snobby when it comes to what designers call "Steampunk." I think that most people would agree that Steampunk is the marriage of Victorian aesthetics with modern technology. To me that means a little more than adding gears to a design. One of my favorite Steampunk designers is Richard "Datamancer" Nagy, who designs Victorian-inspired casings and keyboards for very modern computers. If I could afford his work, it'd be all over my house. Hard as I think that it is to create true Steampunk jewelry, the reason that I began to identify this necklace with the Steampunk philosophy was because of the way it combined primitive, matte stones, embedded with "modern" shiny fine silver; the way the gemstone fringe softened the aesthetic in a Victorian way; the chunky links of the main chain with fine wire coil embellishments, and the lines of the embellishment chains. Others may well disagree, but regardless of how you'd classify this piece, I love the way it turned out. 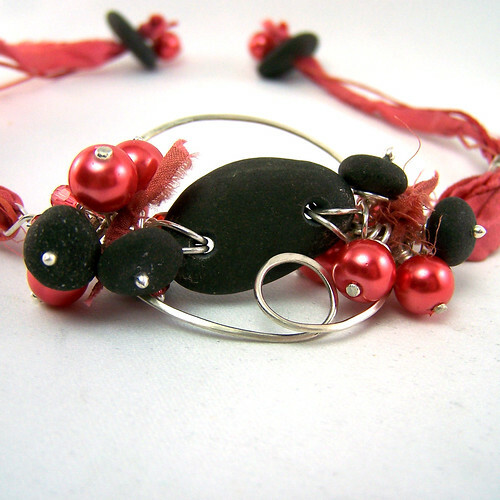 You can see several other images of this necklace on my Flickr page. Kristin has a Boho style aesthetic. I knew that, coming from her stash, that she'd send me the ingredients I needed to make my own attempt at a Boho style design. I come from a background in Physics and (then later) Archaeology and History, so the philosophy behind my designs strongly considers the concepts of permanence versus impermanence, strongly prefering techniques and materials that show characteristics of permanence. Thus, I do a lot with metal, stone, and glass. Boho, with it's organic, soft, fiber-based designs is at the opposite end of the spectrum. This was the perfect opportunity for me to give it a try. The design started with the drilled stone that was in my bead soup, and figuring out how to combine it with the silk and cording. Me, being me, I had to also find a way to include a lot of beaded fringe. Threading the silk through the holes on the stone hid too much of the stone for my taste; I wanted more separation between the silk and the stone. I soldered two silver loops, threaded each through one of the stone holes, and used a simple hitch knot to connect the silver loop to the stone; then I twisted the excess wire on either side of the stone, leaving loops on the ends for the fiber. This let the stone stand out as well as leaving me a place to connect the fringe. The wire frame around the stone came as a solution to the dual problem of containing the fringe and adding more emphasis to the stone. I absolutely love the softness of the fringe and fiber and the way it contrasts the stone and wire. This isn't something I'd ordinarily design, but I think it turned out great! 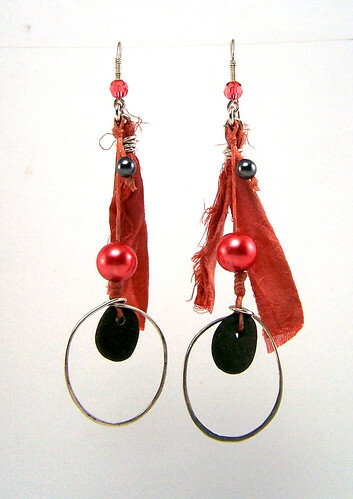 I made some matching dangling earrings, too ... because dangling is the only way I do earrings! upper left - bracelet using the coral and faux beach glass Kristin sent, to which I'm adding some lampwork of mine. upper middle - necklace using the rhodonite Kristin sent, along with some of my lampwork. 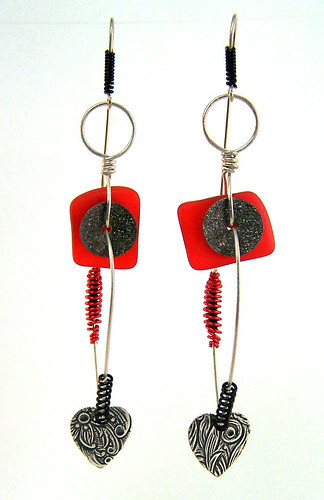 The design I planned uses the wirework motif I used in the red and black Mod earrings I finished. Middle - for earrings using the coral Kristin sent, along with some of the gemstones from my stash. Right bottom - peach bracelet using the glass beads, gunmetal spacers and caps, and peanut seed beads that Kristin sent. So, there it is. There are more photos of these designs, of course, on my Flickr photostream. What do you all think? I have to comment on each piece individually and first say....HOLY MOLY....( I really wanted to say holy crap) well now I kind of did. It is total diva punk rocker girl......I LOVE IT!~ and I get that you had to totally not look at my vision of this....to distracting. I AM SO IMPRESSED! Okay that is number 1. back to looking! lol. I'm so glad that you liked that piece, Kristin! Part of me was wondering if you'd go "why, oh, why would you drill into one of Jeff's heart pendants?! WHYYYYYYYYY?!" You might have to message me on the possibilities of purchasing this if you are going to sell it. You might want to keep it awhile to see what happens with Lori's competition. I am guessing that this will definitely be at the top of the list for awards in one of her categories!!!!! Number 2...I love to play with hard and soft and I think you did this very successfully. I see you in your design here by adding the bright silver. A very successful marriage. Thank you so much! This was the piece I was the most unsure of, but really wanted to work. It really was out of my scope :) Fortunately I had some great inspiration from looking through your designs! The earrings I am absolutely in love with the second set. 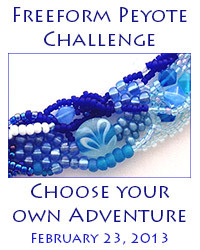 I saw this design of yours at the Bead Bash in a necklace you made. These are really fabulous!!!! I love the mod yet utilitarian feel you gave them. Yay! They are my favorite, too! It really does let those flat beads stand out! No shame here....I love the evolving piece at the bottom!!!!!!! I didn't get all your components used that is for sure. What a great marriage, thanks for sharing your process and your lovely beads with me. 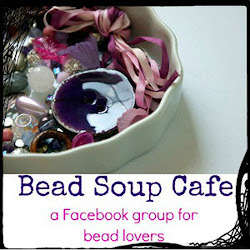 :) It will be fun to have those beads to work with. I've never made a two-holed focal bead before, but your coral beads inspired me to make one! Though the colors you sent were totally perfect, some of the shapes and textures were unusual for me, so they did make me stretch my imagination; I really appreciated that! Thank you SO much, Elizabeth! That necklace was a labor of love! You are fascinating, Julie and your jewelry reflects that quality perfectly. I applaud that you know and understand yourself and are not afraid to march to the beat of your own drummer. Your students are lucky to study with someone like you. Bravo! That's so flattering, Chris. Thank you! I certainly try to be true to myself and find value in the world around me to share with others! That's a lovely compliment DArsie! Thank you! I do work hard to be thoughtful about how I use materials in my work! lol. That's sweet. Thank you, Jelveh! Beautiful jewelry, I particularly like the red bracelet with the fringes. 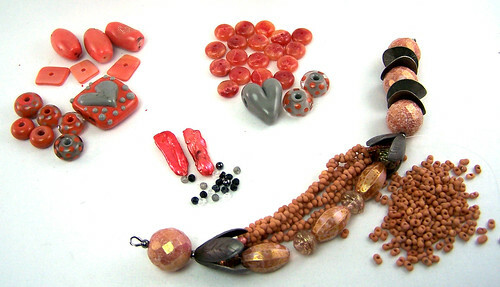 Love the layout of the beads you have left, can't wait to see how you use them too. Aww. Thank you so much, Dolores! I'm excited to still have some fun things to play with! There should be no shame. All you needed to do was use the focal and clasp which you did. You created a beautiful modern piece and several other pieces besides. You have a great style to your pieces. All beautiful designs but oh my I am in love with your necklace, such a stunning piece, what you did with the stone is amazing! Wow. Thank you, Nicky! I was so pleased that it turned out the way it did. This is the first time I've used the technique to embed metal into stone. Michael Boyd was totally my inspiration! I am going to have to check him out. Very inspiring! That's so sweet, Gina! Thank you so much! Beautiful work, Julie. 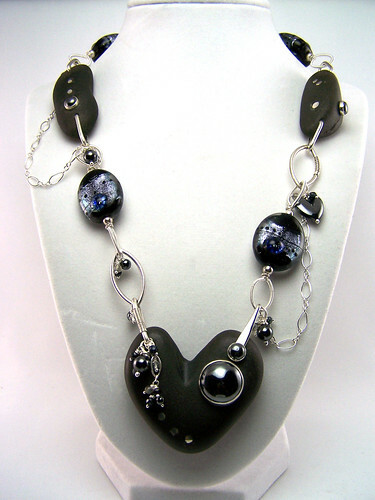 I like especially the first necklace with it's dramatic style and those eye-catching lampworkbeads in it - wow! Your Beads are amazing - I also took a closer look to previous pages ..... stunning work, chapeau! Thank you so much! I love finding ways to incorporate lampwork whenever I can! I wish I could take all of the credit, but glass is such an amazing medium with an enormous range of possibilities! super used of fabric and wire! congratulations! Thank you ever so much! It was a challenge for me getting that piece to work out well. I'm always glad to hear that people like it! While I would love to see he rest of your designs, what you have shown us is more than enough to showcase Kristin's beautiful soup! Thanks, Beti. It's nice to hear that! I think of it as a fun thing that I get to do. In really appreciate how the exercise helps me expand my creative repertoire! Don't worry there are never enough hours in the day, besides that stunning steampunk necklace and those gorgeous earrings more than compensate. Lol. Right?! Thank you for you lovely compliment! Wow! Amazingly inventive and dramatic pieces....love them! Awww. Thank you so much! That's really sweet! WOW what a wonderful soup and beautiful creations...can't wait to see the remaining pieces. Thanks so much, Cheri! I'm excited to finish those pieces up! Kristin's Soup has been so much fun to play with! I love everything you created with your soup. Unique and funky.....just my style. You are an amazing artist and I will continue to follow your work. So inspiring. It's so heartwarming to hear feedback like that. Thank you so much, Nan! These are definitely the most original pieces ever! I love how you mixed such different media! That's amazingly sweet, PiPa! It was a fun challenge to expand my usual techniques and materials. I'm so glad that people are responding to them positively! Totally, completely in awe of your wirework. 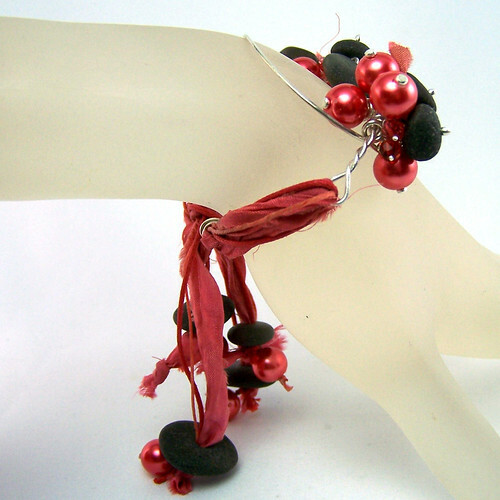 Beautiful pairings of beads and metals. I would have to stay here all day to take in all the details. You MUST promise to show us the peach bracelet when it's finished - you've got a fantastic start on it! Lovely. The black necklace is soooo elegant yet urban!Nice combo! Awww. Thank you, Kathy, for such a sweet comment! I do like jewelry that has a little edge - aesthetically appealing with something to think about. Completely awestruck. 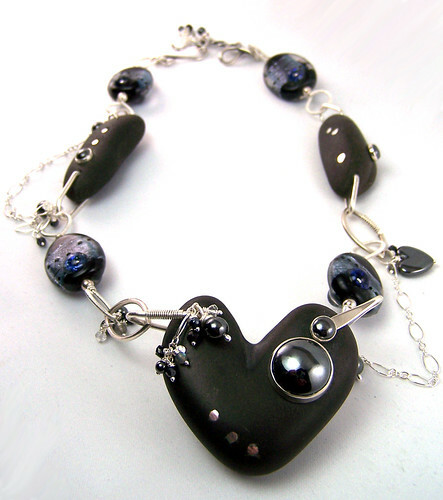 The black, stone necklace is something that should be worn by movie stars or haute couture models. Your work is stunning in every way!!!!!!!! That is the most amazing compliment! Thank you! Now I just need to develop the confidence to market my work to that crowd :) Thank you so, so much, Nancy! It means a lot to me coming from someone as talented as you! I really appreciate where you are coming from re: permanence. I challenged myself to use some sari ribbon in my piece as well and I really enjoyed how it came out. Your steampunk necklace is fabulous!!! Your necklace turned out super cute, Tammi! I think you did a great job with your sari silk! It's fun to experiment with! Thank you so much for your sweet compliment! I really love your style, great designs! Love all your pieces!! The necklace is stunning!! Great work! The steampunk necklace is awesome!!! Love it. Thank you so much, Kiersten! It was a joy to create! Namaste, Brandi! Thank you so much for the sweet comment! Now THAT'S a rewarding compliment :) Thank you so much, Cheryl! I really appreciate that! lol. That's heartwarmingly sweet, Susan! Thank you so much! Part of me was torn when I started drilling into them, but the vision I had was so strong ... and I'm so pleased it turned out as well as I imagined! Wow! I really love what you did..such cool pieces! Thank you so much, Patricia. I was hoping people would find them different. Julie all of your pieces are very unique and creative. Good job using your soup. That's sweet. Thank you, Becky! I worked hard to (try and) make every bead look its best! Each and every one of those pieces has so much character and personality. Your style is so unique and stands out. Wonderful! I can't believe I haven't responded back yet, but thank you so much for your lovely comments and taking the time to leave them! I appreciate it so much! I can't believe I haven't responded back to this yet, but I wanted to say how much I appreciate your thoughtful comments. It's really inspiring to me to me. Thank you, Bobbie! Wow! Your designs are flat out incredible! I just love the necklace and how it pairs both industrial and victorian. And the bracelet looks so soft and wearable. Great job! Gosh, thank you, Shaiha! I'm so sorry it's taken me so long to reply! Your comment was really wonderful and I really appreciate the time you took to make it! Love your jewelry. You are a very talented jewelry designer. Gee, Thank you so much, Denise! I appreciate it so much! It means a lot to know that my work has enough merit to motivate anyone to comment. Thank you! !